This large painting depicts the scene of a planet and its moons steeply rising above the rugged wall of a large crater. In the foreground stands a solitary obelisk. 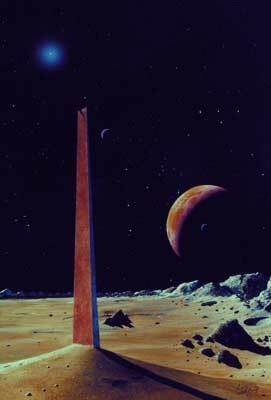 Its base buried, its top violently truncated, the monument is a memento mori, a symbol of the transitory nature of civilizations which, upon reaching their zenith, are shattered, abandoned, forgotten. The piece is mounted in a modern, glossy, black lacquered frame with a black fabric scoop. A single custom color print of this painting was made to serve as an artist's proof, but no prints were ever made. The print is mounted in a rounded black frame, and matted in rich brown with a fillet colored in the hue of the planet in the background. Original  40" x 27"